During this month of unprocessed eating so far my breakfasts have mainly consisted of oatmeal or granola until I decided to try making this Egg Muffin Recipe. I was inspired by Egg Muffins on Kalyn’s Kitchen blog as well as many recipes for Egg Muffins from the trendy Paleo Diet. Really the possibilities for these little breakfast muffins are limitless and the best part is, they are full of protein and completely unprocessed. With the addition of spicy peppers and kale you also get kicked up flavor and added nutrients like vitamin c, beta carotene and calcium. And of course a little cheese doesn’t hurt either. These muffins can be made prepared and baked in less than 45 minutes and provide breakfast for a week! Grab two of these on your way out the door in the morning or reheat with a cup of black coffee for a perfect start to the day. A few tips for this recipe: use parchment muffin liners if you can find them, that way you don’t have to spray the liners and the eggs won’t stick. Also, I used a garlic condiment from Laziz Foods, Toum, to season the eggs a bit, but you can also use minced garlic. 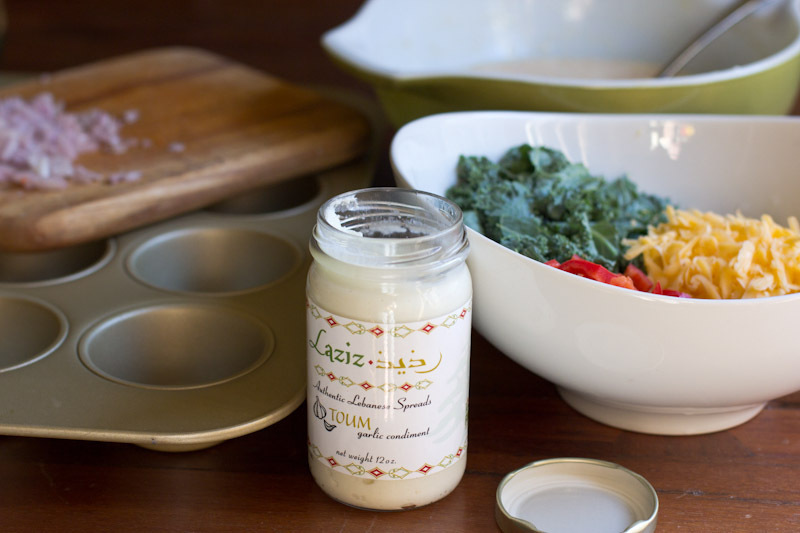 If you’re in Salt Lake, you must try this garlic spread, you can find it at the Farmer’s Market and other Farmer’s Markets around town. I’ve really been adding it to pretty much everything lately. And another note: if you don’t have kale or a spicy pepper lying around, use whatever vegetables you have on hand. Although I loved these vegetarian, with the spicy peppers and kale, next time I think I’ll try adding some bacon or spicy breakfast sausage as well! What’s would be in your ideal Egg Muffin??! 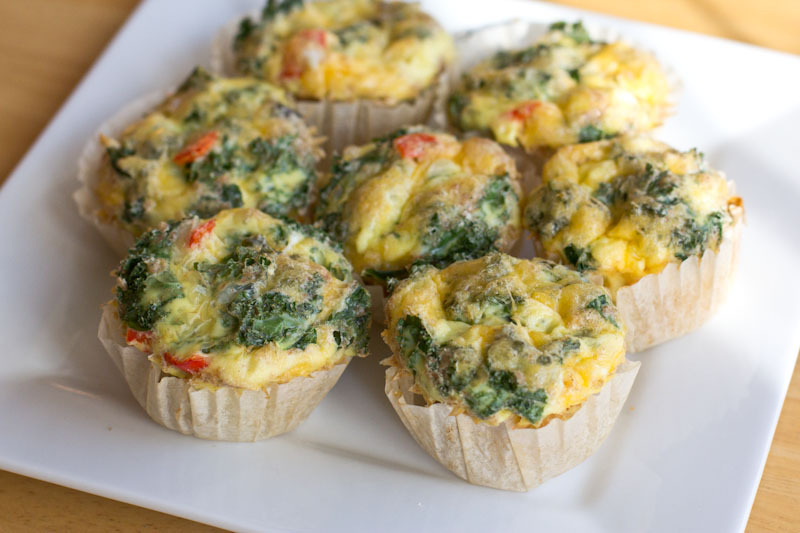 This savory egg muffin with veggies is a great healthy, make-ahead breakfast! Preheat oven to 350. Line muffin tin with parchment muffin liners or paper liners sprayed with cooking spray. Chop the kale, shallot and red pepper. Mince the garlic if you're using whole garlic. In a large bowl whisk all of the eggs together with the milk and flour. If there are a few bubbles of flour that's okay, they will cook out. Add in garlic, salt and pepper. 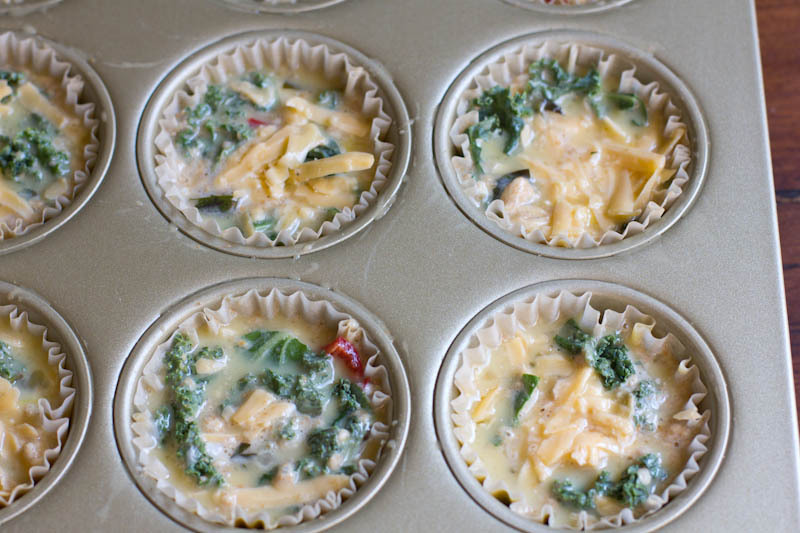 In the muffin pan divide out vegetables, shallot, and cheese. Using a 1/4 measuring cup pour egg mixture into each muffin liner. these muffins can be refrigerated and reheated for later use. These are a regular in our breakfast rotation (for the grown-ups, at least) because it is such a easy way to eat eggs in the morning. I like to bake them in silicone muffin cups because they slide out so easily and I can re-use the cups; I did them straight in the muffin tin one time and oh, sticking! Eggs really are like culinary glue. Julia, I was so glad when I found the parchment muffin liners since I don’t have silicone muffins cups. I figured these would be pretty sticky. When you make them what ingredient combo is your favorite?? Thanks for the silicone cups comment; I jusr bought some and haven’t tried them. anything that involves garlic sounds great to me – if we ever make it out to SLC i’m going to get some of that immediately! I make very similar muffins and also a full pan breakfast casserole. 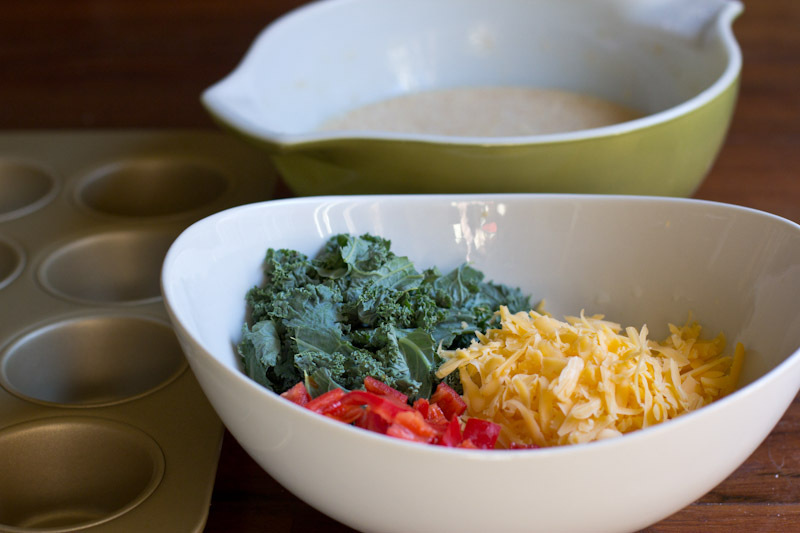 Whenever I use kale, I love the thought that I’m getting my dark leafy greens first thing to start the day. What a great recipe. I am always looking for more recipes for kale. hahahaa!!! I love that typo. whiskey = whisk. thank you. 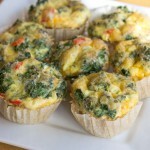 I love egg muffins, they’re so easy to bake, toss in the fridge and pull out on the go. I love stinky cheese and ham. But I’m just that kind of girl. I like that about you. stinky cheese girl! Love the grab-and-go portability, love that it’s vegetarian (but flexible), love that it’s got lots of kale for a nutritious boost first thing in the morning. All love! Yes, feel free to freeze and reheat as well! I don’t have spelt flour or wheat flour. Would all purpose flour work? Thanks! Yes, all purpose will also work fine! I’ve made a version of these w/o any flour but added cottage cheese for a more quiche-like muffin. Have used a whole host of veggies, including spinach, green peas, zuccini…. my kids love them. I’m psyched to try w flour and add a bit of umph to it. Sounds like you found some tasty combos! I’ll have try try using cottage cheese too. I am so glad I found this receip I eat a lot of eggs for breakfast, but don’t always have a lot of time to prepare my breakfast. It’s probably not perfect as your I skip the flour, but close enough. I love that I can freeze and reheat. Wonderful! Glad you’re enjoying them too! YAY!! They are easy to make too and I think they are actually supposed to be made in a silicone pan but I just didn’t have one so you’re in luck!